Maybe this is something that has never crossed your mind: despite the benefits of eating seafood, what are the ethical implications of doing this? Seafood consumption impacts consumers and the marine environment in both positive and negative ways. Fish consumers may experience an increase of gray matter in the brain, as well as nutritional benefits, but those benefits may be balanced against mercury contamination. Environmental impacts include unsustainable harvesting and other alterations to the oceans’ health. Yes, you probably heard about all of these before. However, in addition to consumer-related and environmental concerns, labor trafficking (over 45 million people around the globe are trapped in some form of slavery, see the Global Slavery Index 2016) – has become an issue in the fishery industry worldwide. Do you know or do you even care if your fish was caught with forced labor? Forced labor or labor trafficking encompasses a range of activities (e.g. : recruiting, harboring, transporting, providing, or obtaining) involved when a person uses coercive means to compel someone to work. Most enslaved workers are involved in the agriculture, fishing, construction, manufacturing, and mining industries. In fishing, this forced labor is used on illegal vessels across the world, regions such as Asia and India being especially risk-prone both to labor trafficking and illegal fishing. 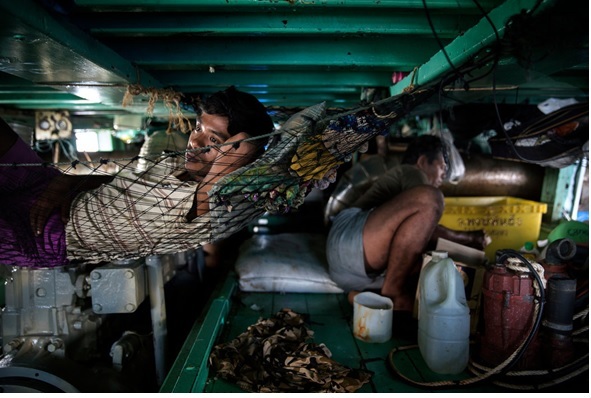 The world’s fourth-largest seafood exporter from Asia, Thailand, has been gained international attention for labor trafficking because it is estimates that up to 300,000 people work as slave in its fishing industry. Forced labor and other rights abuses are widespread in Thai fishing fleets, which carry around 60 exploited workers per boat and go out to sea for months at a time. In this way, fishers wound up working in terrible conditions for no pay at all, for years at a time, and can be sold from captain to captain for not much more than $430 each. In 2014, a report revealed the strong relationship between Thailand slave labor and the global shrimp supply chain, involving supermarkets and restaurants in the United Kingdom and the United States, like Walmart, Kroger, and Red Lobster. The United Kingdom already has legislation in place covering many aspects of work-on-board fishing vessels, but much of this needs to be updated in order to comply with the International Labour Convention – ILO 188. Furthermore, since the European Union threatened to ban its fish imports in 2015, Thailand’s government has been considering fishing industry reforms. 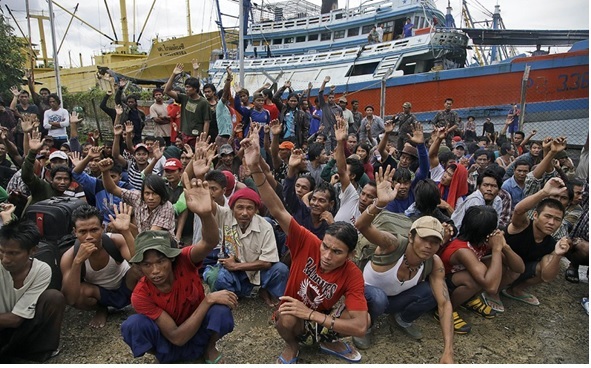 That said, little has been done; the last Human Rights Watch’s report shows rights abuses and forced labor continue in Thailand’s fishing sector. However, raising awareness with the goal of preventing labor trafficking in the fishing industry has inspired widespread activism and research working both against forced labor and for sustainable fishery. Recently, the Monterey Bay Aquarium launched its first database to combat forced labor in the fishery industry. The Seafood Slavery Risk Tool is a database jointly run by the Seafood Watch program, Liberty Asia, and the Sustainable Fisheries Partnership. It is designed to help corporate seafood buyers assess the risk of forced labor in the seafood they purchase by checking a fishery risk rating varying into critical, high, moderate or low. The new tool considers reliable indicators about known abuses, illegal, unreported and unregulated fishing, duration of the fishing trip, and evidence of forced labor, human trafficking and child labor in other sectors. Different from the Seafood Watch app, which advises retailers on which species into purchase, this new program seeks to change the seafood industry by working with suppliers to change their practices, talking openly about slavery and human rights. In 2014, nearly 3 billion people relied on fish as their main source of protein. Rather than leaving the government to address the causes of slavery labor, we, as fish consumers, can change corporate practices by speaking out against companies profiting from unsustainable fishery. Before we purchase seafood, we need to ask the following questions: How was this fish caught? Does the fishing gear result in bycatch and/or habitat destruction? Where on the food chain does the fish live? Is it wild or farmed? Did slaves catch my seafood? If we want fishing to remain part of our culture, we should choose seafood carefully, taking into account the social, environmental, economic, and, sure, ethical issues across the whole supply chain. With this in mind, would you think cautiously before eating or buying seafood next time?